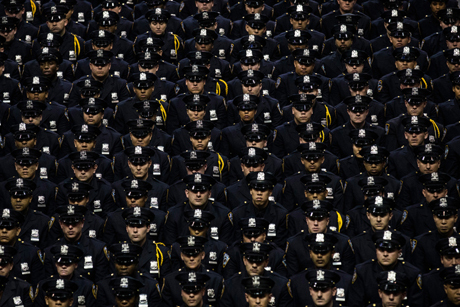 The New York Police Department: Striking Against the Public Safety? Last month, New Yorkers became test subjects in a remarkable social experiment when their police department all but went on strike. Starting the week of December 22, arrests and citations by the NYPD plunged in comparison to the same period a year earlier. Summons to criminal court for low-level offences and citations for traffic and parking violations plummeted by almost 95%. Overall arrests were down an incredible 66%. The slowdown continued during the following week, which produced equally astonishing figures. As wonderful as it would be if these developments were due to a sudden outbreak of libertarian fever among New York’s finest, the truth is quite the opposite. By way of background, during New York City’s 2013 mayoral campaign the eventual winner, Bill de Blasio, spoke out against the NYPD’s “stop-and-frisk” policy that disproportionately affected racial minorities. After taking office, he dropped the city’s appeal of a court decision that ruled the program unconstitutional. The unions objected to this decision and even sought (unsuccessfully) to carry on with the appeal themselves. The intention of the slowdown is presumably twofold. First, to remind New Yorkers of how much they need the police (and how much the latter deserve the mayor’s unconditional support). Second, to starve the municipal budget of a much-needed source of revenue: In 2013, fines of all stripes swelled the city treasury by about $800 million, over $500 million of which came from parking tickets alone. The answer might lie in part in a directive, purportedly from the Patrolmen’s Benevolent Association, that read in part, “Absolutely NO enforcement action in the form of arrests and or summonses is to be taken unless absolutely necessary and an individual MUST be placed under arrest.” Apparently police officers had been arresting people just to pass the time. Another important part of the answer may lie in an admission by an NYPD officer that he and his colleagues have quotas—one arrest and 20 summons a month—and that “[o]ur primary job is not to help anybody, our primary job is not to assist anybody, our primary job is to get those numbers and come back with them.” His statement is one indication among many that New York police are under pressure to generate arrests regardless of whether crimes are actually being committed. It is therefore unsurprising that arrests could plunge without diminishing public safety. Ironically, the slowdown has given the NYPD’s critics something that they have long called for: an end to “broken window” policing, in which petty offences such as public urination or public drinking receive zero tolerance on the theory that cracking down on such minor law breaking discourages more serious offences. A side effect, however, is to increase the opportunities for friction between police and citizens suspected of wrongdoing. Exacerbating matters, the NYPD appears to have a racial profiling problem—even among current or retired black NYPD officers, a recent Reuters investigation found that 24 of 25 who were interviewed had been profiled. The result is a toxic mixture of racial confrontation that falls on the backs of low-income minorities, who are almost certainly the work action’s biggest beneficiaries. The NYPD’s job action also raises a much bigger question, namely whether we need police officers in the first place. Most people, even in libertarian circles, would respond in the affirmative. But there are convincing arguments that laws need not be enforced by public employees who enjoy a privileged legal status—and that private security forces who are paid willingly for their services, who are answerable to their clients and who are liable both civilly and criminally for any harm they cause would be far superior. This is, admittedly, too radical for most people even to contemplate. But if America’s largest police department can all but abandon the enforcement of a huge swath of laws without the sky falling down, then maybe it is worth considering whether the police, in their current form, are as essential as so many of us assume. Tragically, the victimless “crime” that triggered the slowdown—Eric Garner’s alleged sale of individual cigarettes—is exactly the sort of activity to which New York’s police are now turning a blind eye. It is an activity that a sane legal system would never have criminalized in the first place. Garner’s interaction with the police was effectively due to suspicion that he was committing an act of entrepreneurialism. And a would-be Eric Garner who today decides to sell cigarettes to willing buyers can probably rest easy knowing that the NYPD’s interest in stopping him has evaporated. The longer the slowdown continues, the more evidence there will be that the police were hitherto far too aggressive and zealous in their enforcement of the law. And rather than begging their police to turn back the clock, New Yorkers may instead demand that the NYPD make a clean break with the past and abandon its old habits permanently.